Home Costs > How Much Does a Box Spring Cost? How Much Does a Box Spring Cost? A box spring acts as a base for a bed and is usually made of a wooden frame, covered in cloth, and filled with springs or coils to create a little bounce. 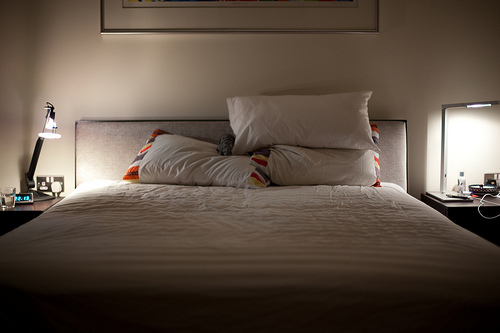 If your quality of sleep seems to be diminishing, you should check your mattress and see if it still offering sufficient support; however, the problem may not stop here. Contrary to what most people believe, the comfort of the entire bed is not only determined by the mattress but by the box spring as well. In fact, the two are designed to complement each other. A box spring is very important as it does not only elevate your bed to a height that is more comfortable, but it reduces the wear and tear on your mattress. On average, the cost of a box spring will depend on the manufacturer, the type, the size of the bed and where you purchase it from. On average, be prepared to spend $100 to $250 or about 10 to 20 percent more than this if you were to purchase a split box spring. 95 percent of the time, however, you should be able to find one of decent quality for less than $150. At Walmart, for instance, the average box spring sold in its stores and online will be anywhere from $95 to $250. On Amazon.com, most of the best sellers listed ranged anywhere from $89 to $118. There are two common box spring heights on the market: either the standard nine-inch box spring of the low profile five-inch box spring. As for types, there are also two options: the split box, which comes in two sections to commonly support a larger sized bed such as a king, whereas a standard box spring will come as one whole piece and will be designed for beds smaller than a queen. A box spring can be made from a variety of options, include organic fabric, hypoallergenic fabric and even natural fillers. Due to the size, some online retailers may charge a shipping fee, depending on the store policy. Depending on your situation, a box spring is commonly purchased with a new mattress and sometimes a frame. As per Overstock.com, you must be careful when transporting mattresses and box springs. Box springs are often considered indestructible, but the wooden frame can crack if abused while being moved. If broken, this can negatively affect the performance of the set. Mattress.com says you should never place a new mattress on an older box spring for two reasons. For starters, it could void your warranty, and it could decrease the comfort and overall support. Do you need a box spring? A modern one-sized bed, according to Us-mattress.com, will not need a box spring and any hard surface will work; however, most mattresses you purchase may require you purchase a box spring to keep the warranty valid. Sometimes, if you were to purchase a brand new mattress, it may already come included with a box spring. If you haven’t started your shopping yet, then consider purchasing it as a package to save and ensure the box spring will mesh well with your new purchase. A refurbished box spring, often found at outlet stores, can be just as good and will cost up to 50 percent less. For example, we were able to find a king sized refurbished box spring at the Sears Outlet center for less than $50.